Below are some of the more popular bespoke cat furniture finishes that we've used but because Hicat® products are made-to-order we have the ability to fabricate to any customer specific request so if you have something particular in mind then please get in touch. This is the latest bespoke Crucial Trading finish to be used on our units & is one of the most luxurious because of the deep pile 100% New Zealand wool - the pile is woven on to a white backing membrane & it makes up similar to the Tibet Wool shown below but also has a horizontal weave detail so is technically more difficult to work with but the results are worth it. We've imported a limited supply of a grey coir, which can be specified as an external & internal finish - this bespoke finish option is similar in colour to the original grey Concrete Coir that we imported in 2010 but batch dyed as opposed to pigment painted so the previous issues with unfinished fibres showing through is a thing of the past. We were aiming for a neutral grey close to the original Concrete Coir but the Slate Coir has a earthy look to it because of subtle green/blue/brown tones in the yarn. Our units can be specified in White or Grey Twist Pile internals as an option to the standard Black Twist Pile. 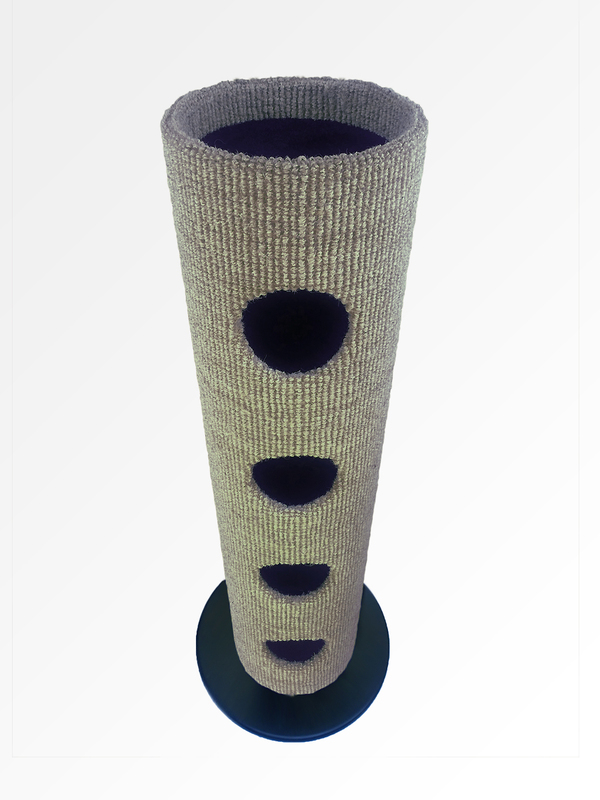 Another bespoke finish option is to specify the internals of the unit in Coir as opposed to Black Twist Pile - Coir is slightly better to grip than Twist Pile so if you think your cat will be spending lots of time running up & down the inside of their Hicat® then you may want to consider this finish noting that the shelves & internal can be finished in the standard Black Twist Pile or Coir. If you are looking for something very special then a wool covered Hicat® is hard to beat & they make-up some of our finest creations to date - our favourite was a range produced by Crucial Trading called Tibet made from Yak hair. The carpet is soft to the touch & has a wide rib, which is sized similar to the coir but machine woven onto a black fabric membrane so technically more regular in terms of weave than the coir - it's also as easy to climb as coir, doesn't shed fibres & creates a cleaner aesthetic finish when compared to the standard coir. This range is now sadly discontinued but we are sometimes able to source remnants so please get in touch if something catches your eye. Coloured Twist Pile internals were once available as special finish option on our units & we can still source bright carpet to use on the inside of units but not in the same colour range that were previoulsy used as these are now discontinued. Where climbing isn’t a consideration the choice of finishes can be widened to include non-boucle & looped type weaves - Bobcat units have been finished in variety of coir & sisal finishes including a traditional herringbone coir & basket weave sisal. We can look at covering our units in any material & have previously fabricated Hicat® units in sisal, seagrass & jute finishes. Please use the Order Form at the bottom of the standard Product Pages to order your Hicat® noting your bespoke finish in the Makers Notes section & we will advise on the cost against the specification as part of the order confirmation.